As the result of several severe winter storms, 11 contiguous seawalls encompassing almost 1,000 linear feet of shore protection were damaged or completely demolished. Childs Engineering Corporation was retained to provide existing condition evaluation, storm damage risk analysis review, and develop the design for the repair or replacement of the damaged and deteriorated seawalls. Childs provided the services to both single property owners as well as a consortium of abutting property owners. Childs assisted in procuring the necessary permits from local, state, and federal agencies to undertake the repair and rehabilitation of the seawalls. 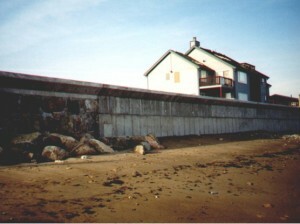 The primary design for the seawall replacement was a reinforced concrete seawall with riprap toe protection on the exposed ocean side. The composite reinforced concrete design with the toe protection eliminated the need to go significantly below mean low water elevation in establishing footing grades for the new seawalls.